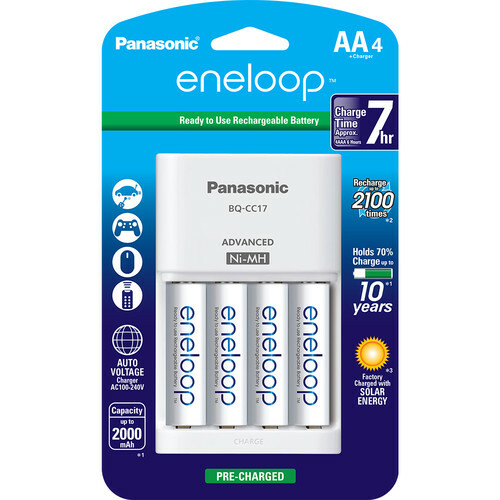 This pack of Eneloop AA Rechargeable Ni-MH Batteries from Panasonic comes with a charger and four batteries that have a capacity of 2000mAh, and are factory-charged using solar energy, so they are ready-to-use right out of the box. They hold 70% of their charge for up to 10 years, and can be recharged up to 2100 times. Box Dimensions (LxWxH) 5.5 x 3.7 x 1.0"
Eneloop Rechargeable AA Ni-MH Batteries with Charger (2000mAh, Pack of 4) is rated 4.8 out of 5 by 105. Rated 5 out of 5 by Mantidfly from Glad I finally tried these The flash recycles and is ready to fire again much quicker now that I am using the Eneloop batteries. Great for the environment; I didn't realize before that the number of times they could be recharged was so much higher than other batteries. This actually makes the Eneloop batteries cheaper per use. While the charger estimates 7 hours for a recharge, the few times I've used it since purchased have only taken about 5 hours. The batteries were probably not fully drained; just low enough that I needed to switch batteries in my flash. Rated 5 out of 5 by Price from Highly Recommend for Professionals! These Eneloop rechargeable AA Batteries are amazing. Ready to use right out of the package (although I did have to charge them after my second session) but they charge like a dream and can be charged even if they are only partially drained. Recycle rate with my external flash is great and didn't overheat on a 90 degree Summer outdoor wedding day. Charging system rates each set of 2 batteries so you can see when they are finished instead of guessing if all 4 are done or not. Easy to use and highly recommend these to my fellow photogs and other professionals. Wish I would have ditched Energizer sooner! Rated 5 out of 5 by William from Not your typical Ni-MH batteries I bought a dozen of these Eneloop's because I was going through tons of alkaline AA's and it was getting really expensive. So far they are very impressive and they are already saving me money. In fact I was so impressed that I just bought 4 more and an extra charger. They seem to run longer on a charge than a fresh set of alkalines and they hold a charge well. Can't speak to longevity yet because I've only been using them for a few months but so far I am very satisfied. I've had a few sets of Ni-MH batteries of various brands in the past but none worked nearly as well as these. Rated 5 out of 5 by Douglass the Macro-Photographer from Excellent smart electronic recharger This charger has four charging slots for AA batteries. Each slot has its own green light indicator as to when that particular battery is charging, then extinguishing when battery is charged. This is extremely useful to determine exactly when each battery is ready for use. Also, the batteries and charger did NOT get hot during charging. Rated 5 out of 5 by Robert from Excellent batteries, slow charger Takes about 8 hours for AA batteries to charge. Nice and slow to extend life of batteries. Batteries at last about twice as long in my flashlight as do alkaline batteries. Highly recommended. Rated 5 out of 5 by Geo from My Take From what I know as a journalist for over 25 years: All batteries are usually rated higher than reality. It may be an avaerge rating but they all/most guarentee that a 2500 is 2400 and a 2700 is 2600. And, most/all rechargeable batteries charge faster after a fewe usages, It may be because there is some leftover power. The main rule is to keep the same batteries, in groups of 2 or 4, Etc., together. It is called, Marrying the Batteries. Rated 5 out of 5 by Jessica29 from Good My speedlights actually recycle faster on full power using these batteries. It said that in the description, but i wasn't expecting anything. I just bought them to stop wasting money on disposable batteries. Rated 5 out of 5 by James from Great Product ! Great product! The BQ-CC17 charger does NOT have a trickle charge but DOES automatically shutoff when the batteries are fully charged. I also have older Eneloop batteries that it charged up just fine. 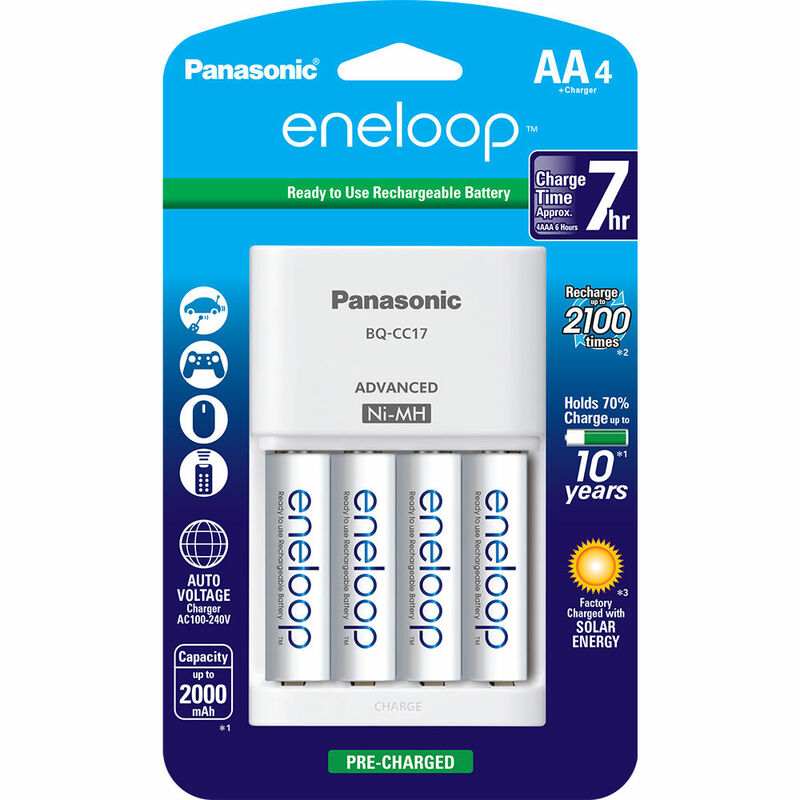 What are the differences with the panasonic eneloop battery chargers? The Pro charger is more powerful, as the Pro batteries have a higher capacity. Yes, the charger in this kit can be used in 220V along with a plug adapter for your particular country. There is a steady green light to indicated that the batteries are fully charged. This charger can be used also for AAA rechargeable batteries? I have a lot of 'Sanyo' eneloop batteries. Will this charger work with those batteries? They charger works great. I have been using the same batteries almost every day for a year. The batteries and charger have given me no problems. I might add that it is a slow charger, which is good. It does not overheat the batteries and I believe that is why they have lasted so lon in my photography flashes. Can this charger be used for eneloop pro batteries also? As long as those batteries are AAA or AA as in being 1.2 to 1.5 volts, yes! About this: Panasonic K-KJ17MCA4BA package with the BQ-CC17 chargerI have AAA NI-MH Panasonic and Amazon batteries that need recharging. Would this charger take my NON-eneloop batteries without problem? I hope to avoid the extra expense to buy eneloop batts if I can. Thanks so much!As to Panasonic K-KJ17MCA4BA package with the BQ-CC17 charger, I have AAA NI-MH Panasonic and Amazon batteries that need recharging. Would this charger take my NON-eneloop batteries without problem? I hope to avoid the extra expense to buy eneloop batts if I can. Thanks so much! How do you know when the charging is done? Can this charger charge other brand NiMh batteries such as from Energizer and Duracell? I have this charger and I have not been able to charge any other brand of battery except the ones that came with it. I have about 20 other NiMH batteries and this charger will not charge any of them.